Best Water Bottle with Filter – Of course we need to think about what’s in our water. It’s supposed to be the best drink for us, yet it’s often filled with harmful bacteria, viruses, lead and heavy metals. The great news it’s fast and easy to filter contaminated water and drink it safely. Basically, use it anytime you want to know you’re drinking clean water without harmful pathogens. This is a great leak-free, BPA-free plastic water bottle with filter. Best use: Great for traveling, hiking, camping, etc., as well as work and around town. Why: I like the option that you can drink water from a stream or pond as well as tap water. It’s lightweight. Best feature: The filter will stop taking on water when it’s time to be changed, which is fantastic so you will know for sure when it isn’t working anymore. Also great: You won’t need to replace the filter for awhile. It will work for 264 gallons of water. 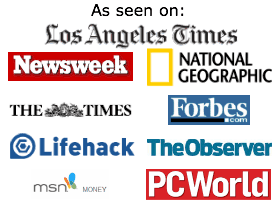 LifeStraw is an industry leader, known for quality products. Their portable water filter and water bottle filtration system eliminates 99.99% of waterborne bacteria and waterborne protozoan parasites. The LifeStraw Go Water Bottle is one of the only water bottles with filters that can filter water from ponds and streams as well as regular tap water. It’s light and it’s leak proof too which make it ideal to bring on hikes, camping, and while traveling. I love how light it is when empty, just over 5 ounces. Like most plastic water bottles, this is hand wash only. This is the latest and greatest in purifying and filtering water. It’s also BPA-free and doesn’t leak. Best use: Easy to take anywhere. Why: Purifies and filters water fast. I like that I can change out the water filter to a water purifier to use when adventuring outdoors in nature. It will work with any freshwater source. Best feature: Takes just 15 seconds until you can drink clean water. Also great: This is essential when you travel internationally. How does it work? Think of a French press — you use your body weight to press down on it. We love it because it offers great filtration and water purification (easily change it to a water purifying filter). It does a great job of filtering silt and particles. You can filter 40 gallons of water before needing a replacement cartridge. GRAYL products are also exceptional at removing 99.999% of what you don’t want in your water, including bacteria, viruses and protozoa. It also will filter dangerous heavy metals, particulates while removing odors. This is also hand-wash only. GRAYL redesigned this bottle to be very lightweight while offering the superior ability to remove contaminants. LifeStraw also offers an essential item — the filter on it’s own. Lightweight: At just 2 ounces, you can bring it anywhere. Ideal for outside activities: It eliminates 99.99% of parasites and bacteria. Lasts a long time: One filter can filter 1,000 liters of water. Best feature: It’s just so small and handy and easy to take with you. There really isn’t a reason not to own one, even just for an emergency situation. You won’t need iodine tabs or batteries or anything to eliminate toxins from any freshwater source. This is truly a must-have item but know that this is just the filter, not the water bottle too. Keep it in your car, bring it when traveling, RV-ing, hiking, camping or keep it as part of your emergency-preparedness planning. It can be absolutely invaluable and possibly lifesaving should you ever need to use it. Best use: The gym, for toting around town, and for your kids at school. Best kids water bottle with filter: This is perfect for children who refill water using drinking fountains. Why: These would be fine for work too but have a more sports-look to them. Also good for hiking because they are lightweight but you have to bring your own water, not source it from nature. 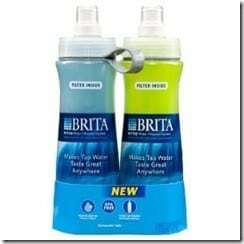 We like Brita products as Brita is a long-time recognized name in water filtration for the home. One of their water bottle filters can filter the equivalent of 300 of the standard 16.9 ounce sized water bottles. They are made from BPA-free plastic. I like that I can throw this bottle in my gym bag and not worry about it leaking. I typically fill it up at home and once again after my workout from my gym’s water fountain. Who knows how often places service their water fountains, so this is a great bottle to choose if you or your kids refill at water fountains at school, the gym, at work, etc. These Brita water bottles filter out lead, chlorine, and other contaminants for fresher tasting water. They come in a set of two. My kids use these in the hotter months during the school year, and say they are easy to refill at their school’s water fountain. We love products made in the USA and Bobble bottles are. Best use: The gym, work and toting around town. Why: Easy to take with me. Downside: Can also take hiking and biking but need to have your own water source. You can’t use this to purify water from rivers and streams. The Bobble with water filter is meant to filter tap water, and they do an excellent job of filtering water to make it free from chlorine and other common organic contaminants. These filtered water bottles comes in a wide range of colors. The filter lasts for 300 bottle refills. Plus it has a recyclable carbon filter. Bobble Bottles are so fun, cute and colorful. I always get a compliment when I use one of the two I own. You can also use it without the filter. This tumbler isn’t leak-proof but we love it all the same. Best use: Taking it from your home to the office, around town, toting in your car’s drink holder, etc. Why: I like drinking from a straw in the car instead of tilting my head back — eyes-off-the-road hazard — with the traditional water bottle. 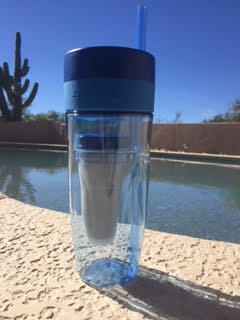 Best feature: What I love about the ZeroWater tumbler is that there is a color-changing indicator right on the filter so you know when it’s time to change it. The ZeroWater Portable Filtration Tumber can be used with or without the filter. The only downside to this for traveling is that it has a removable straw that doesn’t seal. You wouldn’t want to take this hiking, etc. It quickly filters water in 5-stages to remove 99.6% of dissolved solids. Note, this is a water filter for a tumbler. VOCs volatile organic compounds: It removes these as well. So many times you don’t know if a filter is still working and effective. This tumbler comes with the filter. What is the water bottle made from? All of the water bottles we’ve featured are BPA Free. Many people prefer stainless steel water bottles because they trust stainless steel more than unknown chemicals in plastic. I always prefer stainless bottles or glass water bottles when available. What exactly can the filter, filter? Does it only remove chlorine? Or also lead or other toxic chemicals? Note that the majority of water bottles with filters are for potable water, like you get from your sink or a drinking fountain. Before you fill your water bottle from a lake or stream, check whether it can be used to filter microorganisms and toxins. And be sure to double check the claims and do your own research before taking risks with unclean water. If you’re going somewhere and you want to ensure you have safe, clean water, we recommend a Steri-Pen. How long will the filter last before you need a new one? There’s a big difference if a filter has to be changed after 150 uses compared to 300 refills. There are many filtered water bottles to choose from, but these remain our favorites. You will be glad you have it whether you use it everyday or are looking to use it just occasionally. If you are looking for the best portable water purifier for travel or for several people, there are many great ones as well. We love the fresh, clean taste of water and like to feel good about using a reusable water bottle so using a water bottle with a filter is a good idea. Eliminate the dissolved solids and other contaminants and enjoy water again. Filters eliminate odors and improve clarity as well. All of these are great choices. Then you will be able to choose the best water bottle with filter. Some will be more practical for you, depending on where you see yourself using the water bottle most often and where you will be sourcing the water from. 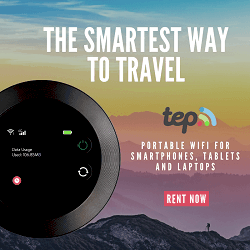 Maybe you want to use it everyday; it’s essential for traveling. Or maybe you want one to be prepared in case of emergencies. The Centers for Disease Control and Prevention have this in-depth guide for using a water filter to avoid Cryptosporidium. Whether you live in a tornado or hurricane-prone area, are prepping, backpacking, or just want to drink safely, it’s important to have access to clean water. These water bottles with filters are effective and convenient. Last year, my husband and I took three months to road trip through Africa. Visiting over a dozen countries in our 4×4 was no small feat and there were countless hours of planning. While I am happy with how we planned and stayed on budget, there is one piece of equipment I wish we would have had with us: a portable water purifier for travel. Instead, we carried 5 liter bottles that we bought along the way. Thankfully, we were able to refill them when we stayed in places with water purifiers so they didn’t end up breaking the bank. However, we saw so many water bottles littered in ditches along the way, we knew that we would choose a more eco-friendly option for our next trip. We have been talking about another African road trip, so it’s a great time to start looking into the best portable water purifier for travel. There will be four of us next time, so we’ll need something that can purify larger amounts than the water bottle size purifiers that are perfect for backpacking. We used this while traveling with Peace Corps members in Namibia. While living in rural Uganda, they used the First Need Water Purifier to purify rainwater that they collected outside of their hut. After getting stuck in Dead Vlei and running out of drinking water, we were thankful that they had their purifier with them. I like that this is chemical-free water purification and is certified to EPA Guide Standards. It also removed dirt and unpleasant tastes, which is a huge plus for drinking water. It purifies quickly, which is helpful while traveling. The original purifier will clean 150 gallons of water before needing to be replaced. This MSR purifier uses Chlorine-based purification, without the iodine taste. This is probably one of the easiest pumps to use—it’s quick, which is helpful when you are pumping drinking water. This would be great for an overland trip, but it is also pretty lightweight, so it could be used for backpacking as well. This is a little bit different than the First Need Water Purifier because it uses drops to treat the water. So, each filter can treat up to 200 gallons, and each 2-ounce bottle treats 80 gallons of water. The MSR SweetWater Water Purification System comes with the drops. Unlike the first two purifiers, this Katadyn water filter is not a purifier. So even though the water will be safe to drink, it may still have some unpleasant taste. However, I like this particular water filter because does have a glass-fiber element inside that does help to improve the taste of water without chemicals. This Katadyn water filter is easy to clean — you just have to swish the filter in water. It also has a handy water bottle adapter, which can be really helpful. I appreciate that this filter does not use any chemicals so there is no chemical aftertaste. It also can filter the most water per filter — depending on the water quality, the Katadyn Hiker PRO can filter up to 1150 liters. This is my all time FAVORITE!!! Any of these portable water filters can be lifesavers and are great to have, even if you’re not planning a trip out of the country. Carbon filter pitchers are one of the cheapest and most convenient ways to eliminate harmful contaminants from your tap water. For years, I relied on my trusty Brita pitcher, but when it cracked, I decided to branch out. The folks at Mavea were kind enough to send me an Elemaris XL to try out. It’s attractive, effective, easy to use, and holds a lot of water. As we all know by now, it’s a good idea to avoid bottled water — it’s terrible for the environment and is often just tap water in disguise. A countertop carbon filter pitcher like the Mavea Elemaris XL is an excellent, sustainable way to avoid bottled water and make sure your water is healthy. I’ve been using my Mavea Elemaris XL pitcher every day for a few months and I really like it. Here are my favorite features and the one downside I’ve found. As you know if you’re a regular reader, we’re all about healthy water and healthy water bottles. Tap water sometimes gets a bad rap, but the truth is, many of the harmful chemicals and pollutants in your water can be easily removed with an inexpensive carbon filter like the one in the Elemaris XL pitcher. I drink a ton of water every day and it’s a hassle to constantly have to refill a pitcher, so I appreciate that the Mavea Elemaris XL holds 9 cups (just over 2 liters) of water. It’s big enough to hold a lot of water, but not so big that it takes up too much space on the counter or in the refrigerator. It may seem like a no-brainer for a water pitcher to be easy to fill up, but not all water pitchers are simple to refill. The Elemaris XL has a pour-through lid, which makes filling it up a cinch. It even has a flap in the pour-through area that automatically closes when it’s full. My recently retired Brita pitcher didn’t have this feature, and I’m really glad my new pitcher does. One of my favorite things about the Mavea Elemaris XL pitcher is that it comes in 6 fun colors: white, black, purple, green, orange, and red. I generally care much more about function than aesthetics, but I use my water pitcher constantly throughout the day, and it’s fun to see that splash of color in my kitchen. It may sound crazy now, but for many years the filter pitcher giant Brita didn’t recycle their filters. After successful lobbying by environmentalists, the company finally started to take back their filters. Fortunately, Mavea has a great filter recycling program. They’ll even pay for shipping when you send your used filters back. Learn how to recycle your Mavea filter on Mavea’s website. The one negative I’ve found with the Elemaris XL is that both the pitcher and the filters are a bit more expensive than similar items from other brands. I’m willing to spring more for a pitcher I really like, but the price difference in the filters will add up over time. These filters are a bit more expensive than some other brands; Brita’s filter, which also filters 40 gallons. Is price a deal breaker? I really like the Elemaris XL’s features and, for me, they outweigh this one negative. Interesting Tidbit: Why Haven’t I Heard of Mavea? While Brita has become a household name, Mavea may not ring a bell. So why haven’t you heard of Mavea? The short answer is you have — sort of. There’s some interesting history with Mavea and what it boils down to is that Mavea is the current incarnation of the original BRITA brand. Clorox bought Brita in 2000, so current Brita products are owned by Clorox. The Brita parent company, though, retained its name — BRITA Gmbh — and now sells its American products under the Mavea brand. A confusing, but interesting, piece of filter pitcher history. The Mavea Elemaris XL is a nice, solid carbon filter pitcher. It comes in great colors, is easy to use, and eliminates a number of harmful contaminants from tap water. The one downside is that it’s a bit pricier than some competitors, but I think the features outweigh the slightly higher price. Mavea Elemaris XL is an excellent alternative to bottled water and I would highly recommend it. I’ve long been interested in finding a Brita pitcher made from glass. You can’t buy any glass pitchers with a built in filter in the United States, but Brita makes a version sold in the UK. You can buy the glass Brita pitcher on Amazon. While expensive, it’s the only place you can buy one, unless you’re headed to England. primarily since you could possibly have done it if you considered necessary. own to know more on the topic of this issue. opportunities up front for those who start reading your site.